The three animated mimi figures on this early bark from Croker Island contrast markedly with the more static figures typical of Crusoe Kurdals's carvings. Although the images are similar, these express concepts relating to sexual misbehaviour (suggested by their enlarged sexual organs). They also feature ant-like heads and internal patterns in the x-ray style typical of rock art from the same region. Yiribana , Sydney, 1994, 8 (colour illus.). 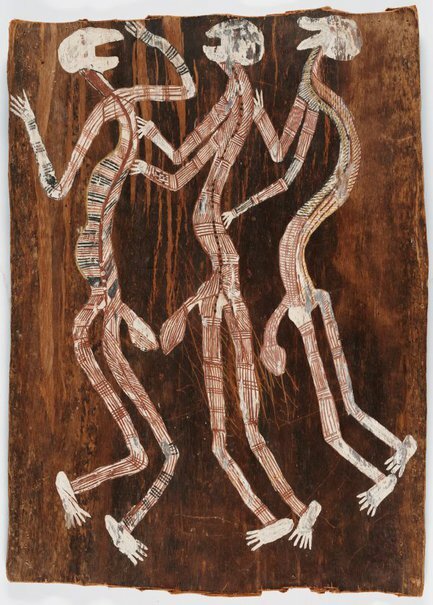 Crossing country: the alchemy of western Arnhem Land art , Sydney, 2004, 28 (colour illus. ), 230. Jill Sykes, Look , 'Crossing country: quotes from the Symposium', pg. 35, Sydney, Dec 2004-Jan 2005, 35 (colour illus. ).